Monette and Mady are identical twins. They have lived their whole life closely together and are, as they say, inseparable. I used to see them on the streets of Paris now and then and I was instantly fascinated by their identical outfits and synchronized corporal language. They stood out from any crowd and I couldn’t quite believe my eyes. I remember thinking that they might not be real. They were quirky and beautiful and I only ever saw them in passing. A bit like the rabbit from “Alice in Wonderland” they always seemed to be on their way somewhere. As soon as I had spotted them, they were already gone. There is something about identical twins that is so fascinating I think we’d agree. Can one really tell when the other is in trouble even when they don’t know? Do they genetically have a special bond or is that a product of upbringing? When we see so much of one person replicated in another we can’t help but be taken aback. 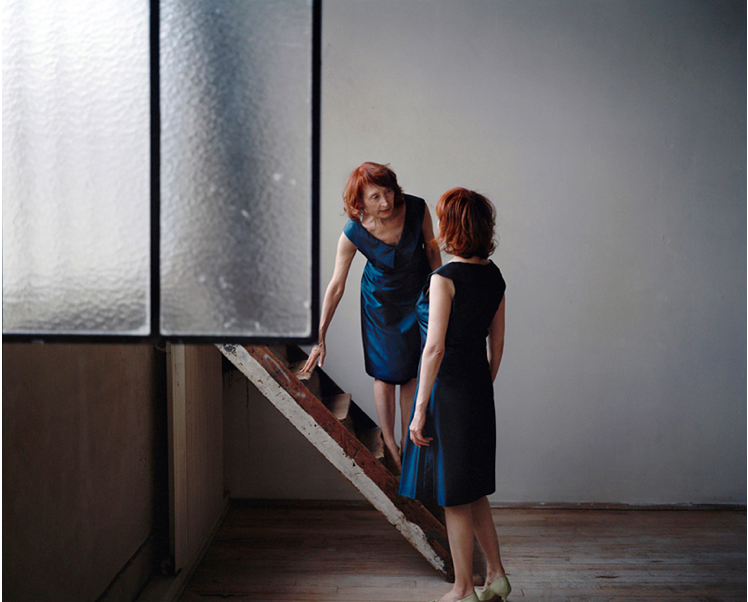 Maja Daniels fascinating project follows these glamorous sisters throughout their daily lives in Paris and becomes an intimate journal of their togetherness. The twins dress the same (choosing identical vintage outfits is no easy task), eat the same food in identical portions, dance and act together and are used to performing for the camera. It took a while for Maja to convince them that their daily life was just as intriguing as their performances. In fact much of the success of this series is that it becomes hard to tell the difference between the role playing and the real. The streets of Paris make the perfect backdrop for such ambiguity to be played out, confusing us with it’s references to film and art, but at the same time documenting everyday events like going or the market or having a coffee. It’s interesting for me that Maja wasn’t sure if they were real at first because they do seem like a mirage or a dream and it’s nice to know that they give this impression in real life as well as in the images. This aspect of fantasy coupled with the painterly way in which Maja composes her shots makes for a beautiful and intriguing project and I’m looking forward to seeing more of it as it develops. With a background in journalism, photography and sociology Maja describes her personal practice as a combination of these things and a love for the written word. Her work was included in the Taylor Wessing Portrait Prize 2011 and exhibited in the National Portrait Gallery, she has recently been nominated a finalist in the Sony World Photography Awards and is featured in this month’s British Journal of Photography. After returning from Israel on an intensive job, Maja kindly took the time to answer some questions for me. What is it about photography you love? I enjoy the privilege of meeting people and telling stories. By using sociological tools to research and to approach to my photographic projects. I feel like I have found an interesting combination in my attempt to comment on the complex interaction between man and society. You seem to have a particular interest in the older generation, as shown in Monette and Mady and the series Into Oblivion. Can you explain what it is that interests you? I am interested in documenting the western world and it just so happens that I started considering the general lack of visual representations of issues related to older generations. This is obviously linked to our commercially driven, youth-obsessed culture, the breakdown of the family unit and so on. As much as these topics interest me, they also present me with challenges in how to make them visually appealing and original. With a background in sociology, photography and journalism I can see how the genre of documentary fits your interests. With Monette and Mady there seems to be a shift to a more fine art based practice. Can you describe this shift? I’m not sure there is such a shift. The project I worked on before getting involved with Mady and Monette was a very challenging one in terms of access. I was taking pictures of people with Alzheimer’s disease within a French geriatric hospital and the project demanded a great deal of administrative tasks. I spent almost two years trying to get permissions and clearing authorisations and releases. I also put a lot of energy into advocating for and explaining my intentions with the project to hospital staff and family members. It was an uphill struggle but a very engaging and important experience. I think my initial thrill working with Mady and Monette was that it was a more intimate project. Also, they were already used to being photographed and no greater administrational efforts were going to be needed. However, the project was – and still is – very much focussed on access. Initially Mady and Monette didn’t quite understand why I was interested to document their everyday life. It turned out to be an interesting challenge for me to make them understand how fascinated I am by what seems so natural and mundane to them. Together, we have entered a journey of getting to know each other and growing to trust each other. We are constantly negotiating what it is that we are doing together and although Mady and Monette enjoy the attention of being photographed, it took me a year to get them to agree to let me follow them a bit more intimately. Did you immediately think they would make an interesting photographic project? In a way yes, but it took me a long time to approach them. Years actually. Their presence was brewing in the back of my mind while I was working on the Alzheimer’s project that I mentioned. That project made me increasingly aware of questions regarding aging and the many stereotypes that are related to this. Mady and Monette however seemed completely indifferent to this in the playful way they carried themselves and stood out from the crowd. They didn’t seem to have an age. When I finally approached them I found out that they have long stopped celebrating their birthdays and that they defy any pre-conceived notions related to growing old. I then thought that the twins could make interesting project that could somehow comment on questions regarding aging in today’s society a bit differently. What was the biggest lesson you learnt when you were assisting fashion photographer Peter Lindbergh and how did it help you become the photographer you are now? I learned so much. Peter is always very passionate and enthusiastic about his work and he is such a hard worker. He works closely with a team of collaborators and assistants that he calls his family and I felt very privileged to be part of that family for those years. A lot of Peters work has a vibe of reportage to it. He started doing this at a time when most fashion photography still happened in the studio and I found this daring crossover approach very inspiring. I’ve always enjoyed looking at different domains for inspiration and both fashion and sociology have taught me important lessons about how I want to approach my projects. How do you find getting your work ‘out there’? Just like any other domain it demands hard work and persistence. Someone told me recently that a person would need to see someone’s work within five different contexts before they’ll actually remember it. Regardless if they like it or not. I think it might actually be true and if it is then there is really an argument for being persistent. Do you have advice to young photographers about finding your market? Although I have long known that I wanted to work with photography, I have spent a lot of time studying sociology and learning about the world in general. I figured it would increase my ability to be able to produce interesting and compelling projects. No matter what market one might be interested in, I think it could be good to approach it with an understanding of its “surrounding aspects” as well. What is your biggest hope for your life as a photographer? I just want to keep making my projects. I am currently experimenting a bit with visual sociology. This is quite a broad term but it basically means that photography is used as a tool within sociological research. A photograph can record important elements and tell us about society in ways where words might be inadequate. Visual patterns are just as important as, say, statistics or interviews and they can then successfully be combined. Photography is a powerful tool because it is easy to relate to and it can help a research project to reach a wider audience. It could, perhaps, be a way of actually getting paid to work on more long-term projects.